8 vendors have this plant for sale.51 members have or want this plant for trade. Make sure you give this plant some room to spread and don't plant it unless you don't mind maintaining it. I planted one in the middle of our garden several years back (ignorantly of course) and it was way taller than I expected. It spread to a patch of about 3'x4' in just a couple years. All well and good but then it started getting weak in the middle and dying out halfway through the summer. I dug it all out and threw it away but not before I planted another one in a different location. Now knowing what I know, I don't let this one get out of control and frequently chop pieces off it to give away. This seems to be a good method so far. Using a shovel to chop off a hunk on the outside is the easiest method. 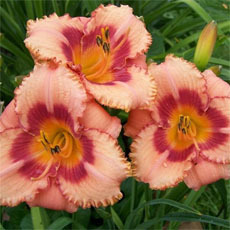 I gave a positive rating because it truly is a beautiful plant and does pe... read morerform well in the garden. It's not the plant's fault I wasn't well informed when it first got planted. A great addition to any garden as long as you can get in there with a shovel to control spread. I agree that this plant looks pretty ratty after blooming. I don't bother keeping it tidy during the season but I do give it a nice (severe) pruning in the fall. Easy plant. Note that shasta daisy 'becky' often looks terrible after blooming. A shame for such a wonderful, long-bloomer. 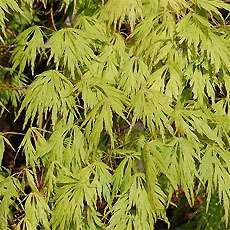 You may want to surround it with perennials whose foliage will disguise its late summer scraggliness. I grow the Becky Daisy in North Atlanta, Ga. and it blooms all summer if I keep it tidy and deadheaded. I have blooms until frost. It outblooms any other Daisy I have grown. Loves the heavy clay soil in my zone 5a yard. Gets really heavy rain, snow storms here; high wind area with no protection and it does fantastic! It was 3 tiny plants, bought from Bluestone Perennials 2 years ago and they have just multiplied amazingly! I think they cost me around $4.50 for all 3 plants? I love this plant! It also blooms for weeks and weeks. I deadhead and it helps. 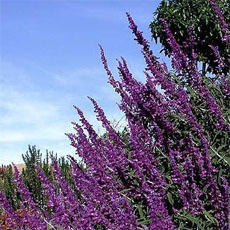 The picture I downloaded here shows it in the middle of this bed, in front of hyssop or agastache. It does great around any plant! My plants are fully 36-45" tall and full of flowers. My only unhappiness is that they tend to look a little floppy on the top 4" or so and so while they don't need staking they manage to look 'sloppy'. I am really confused about whether I have 'Becky' or "Alaska". 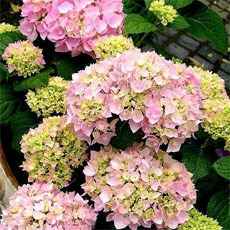 One is very tall as noted above, and the other is a nice compact clumper about 18-20"; much tidier and sturdier flowers. Any suggestions as to which is which? I have studied both flowers here but can't quite decide. I hadn't grown Shasta daisies in many years. I decided to try one last year. This was (see my pics) planted last spring from a small 4" pot. Boy, am I glad I did! Bought (2) in 2007. I divided in both 2008 & 2009. Out of the original (2) plants...it's produced at least 30 other plants for other beds & to pass to friends. Has been completely pest free & drought tolerant. It thrives in Mid TN heat/humidity. Couldn't recommend it more highly. 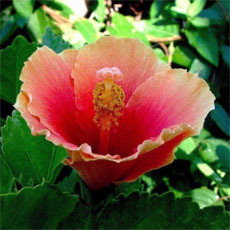 It is the core staple of my front gardens and neighbors continually complement them. I replaced my 'Snowcap' Shasta Daisies this year with some 'Becky' Shasta Daisies, and what a difference! The Becky daisies were outstanding! They really bloomed great and each bloom lasted a long time. With regular deadheading, they have continued flowering from early summer and are still blooming now right into the fall. The Snowcaps daisies I had before, which are a much shorter clumping cultivar, looked great when they first bloomed, but the blooms never lasted more than a couple of weeks for me, even with deadheading. The Beckys just kept on going. I planted Becky last spring in full sun and it was so-so the first year. This spring it has grown vigorously. 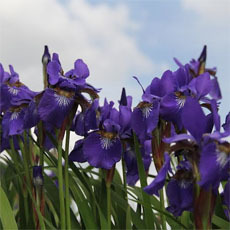 In the first half of July it has been outstandingly floriferous. 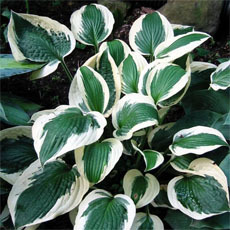 It is the focal point of the garden with its copious bright white flowers. Does not wilt in the heat and sun unlike some other Shasta cultivars. This plant is truly tough and beautiful! Beautiful daisy grows full and tall on the east side of the house. A wonderful shasta daisy, arguably the best overall. It really does stand upright without staking and makes excellent cut flowers. It doesn't seem to be bothered by heat or humidity. Tons and tons of big ol' classic daisies to share with everyone you know. This plant easily grows to to 4 feet and happily survives my bumbling attempts to cut it down a bit in size. Bees can't get enough of it, so be careful. Cut flowers last about 10 days. This is a marvelous daisy, and unlike other shastas, does not seem to go to seed all through your lawn. Holds flowers for a LONG time here in Minnesota, and stays green and strong well into fall with excellent frost resistance. Flowers also remain until late, though blooming stops with increasing cold. Plant notes say "do not overwater," and I can vouch for that: in very heavy clay, the roots will rot. Amend heavier soils to provide drainage. Atlanta - in the fall this plant shoots up a stalk with little leaf clusters. If you cut right above the cluster and leave about 3-4" of stiff stem below, you can stick this stem directly into the ground and have blooming plants next year. The only problem is that you will end up with too many plants! It will grow in full blazing all-day sun. This plant can reach a height of 4' in the right conditions. 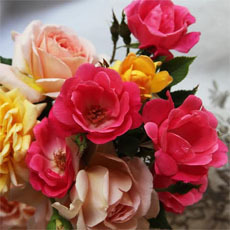 Flowers are pure, bright white with yellow centers. Blooms from June to September. Great cut flower, too. Attractive to butterflies. LOTS of plants to share! If you have the space, this is a wonderful daisy. Dark green leaves contrast beautifully with the big white blooms. They've survived our torential rains here in Delaware without a problem. I have to dig half of them up every year to contain them in my small garden, but it's worth it. Taxonomists now list this plant as Chrysanthemum leucanthemum 'Becky' (commonly called Shasta Daisy). A passalong plant in the Southeast before it was named after Decatur, Georgia landscape designer Becky Stewart, the glossy green rosettes remain evergreen in my Zone 7b/8a garden. Because the flower stems remain upright, the crisp white flowers are ideal for flower arrangements. 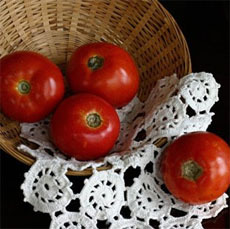 'Becky' is vigorous and thrives in the heat and humidity of Southern summers. Division every two or three years keeps 'Becky' looking her best and provides plants for friends.